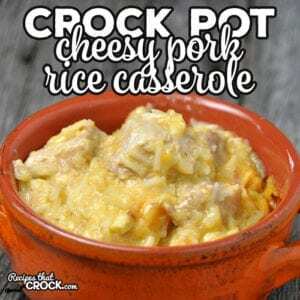 Crock Pot Cheesy Pork Rice Casserole - Recipes That Crock! 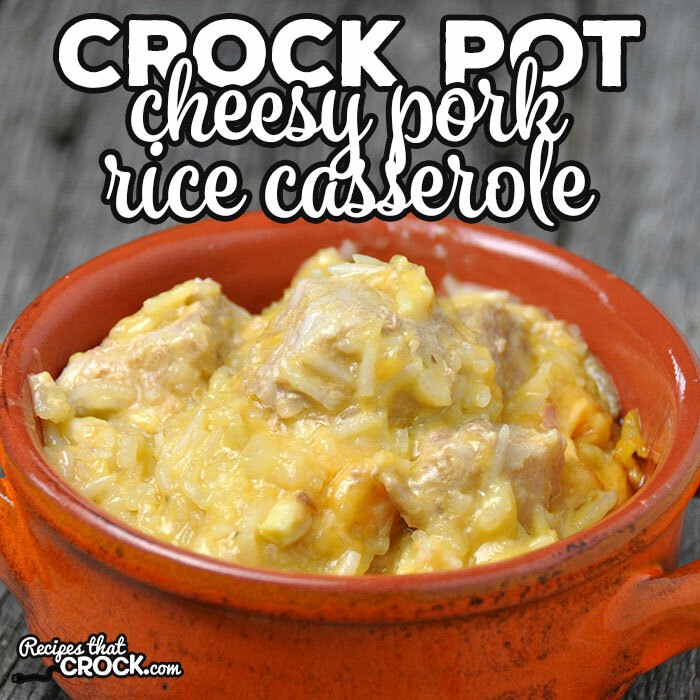 We loved our Crock Pot Cheesy Chicken Rice Casserole so much, that I thought I’d try making the recipe into this Crock Pot Cheesy Pork Rice Casserole. The result was delicious! 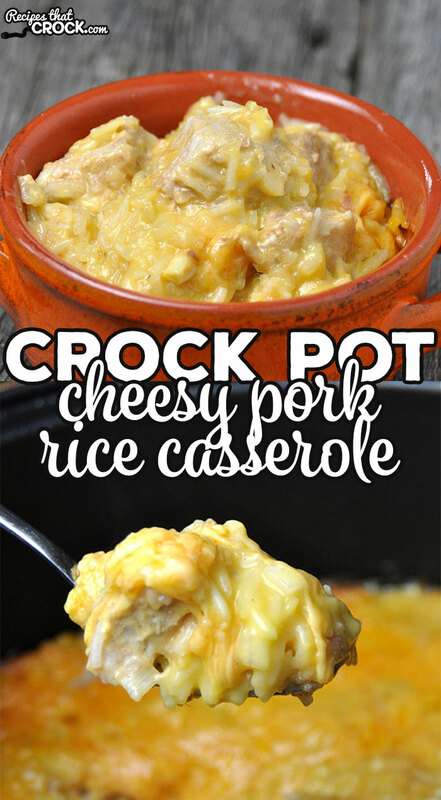 This Crock Pot Cheesy Pork Rice Casserole is a super simple dish that was loved by everyone in my house! I bet it will be a hit at your house too! Spray your crock pot with cooking spray. In a large bowl, mix together your rice, soups, broth and pork. Add in your milk, butter and onion and stir well. Sprinkle with salt and pepper. Spread your mixture into your 6-quart crock pot. Sprinkle Cheddar cheese all over the top. Cover and cook on low for 3-4 hours (mine was done perfectly at 3 hours, but your crock pot may be different, so watch closely the first time so you can know how your crock pot cooks this recipe). Let it stand, uncovered, for at least 10 minutes before serving. In a large bowl, mix together your rice, soups, broth and pork. Add in your milk, butter and onion and stir well. Spread your mixture into your 6-quart crock pot. Sprinkle Cheddar cheese all over the top. Cover and cook on low for 3-4 hours (mine was done perfectly at 3 hours, but your crock pot may be different, so watch closely the first time so you can know how your crock pot cooks this recipe). Let it stand, uncovered, for at least 10 minutes before serving. My favorite long cooking rice to use for slow cooker recipes is Basmati Rice. However, any long cooking rice will work. Unfortunately, as written, I found this recipe to be just okay. I had a couple of concerns & should have listened to my instincts but didn’t. I love butter but here it floated to the top & I spooned most of it out. Also, I love basmati rice too & never have a problem with cooking it in the slow cooker, but this time it cooked unevenly. 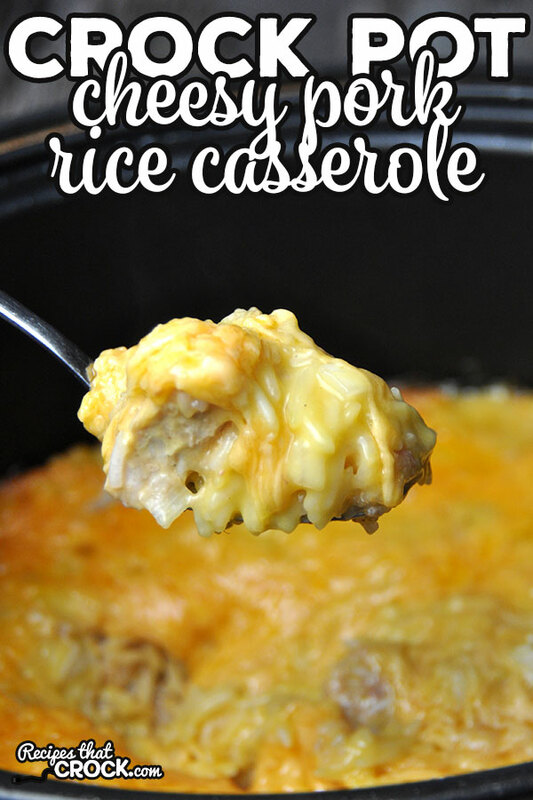 Usually, I give the rice a stir or two but since I topped it with shredded cheese at the start, I couldn’t do that. I will probably make this again but with a couple of changes: no butter & delay adding the shredded cheese so the rice can be stirred. I’m so sorry it did not turn out for you the same as it did for me. I hope the adjustments you mentioned will make it turn out wonderfully for you next time! The pork is uncooked when you mix it together with the other ingredients in the large bowl. If you need to use cooked meat in a recipe for the times we have listed, we will list it as “4 cups pork, cubed, cooked”. I cubed up a pork loin for this, but you could also use pork tenderloin or boneless chops. is the pork cooked or uncooked.